Paper napkins feel like stiff paper. They're terrible for wiping your mouth or hands because they absorb poorly. The actual reason for the strange napkins is not obvious, and not related to cost. The actual reason. 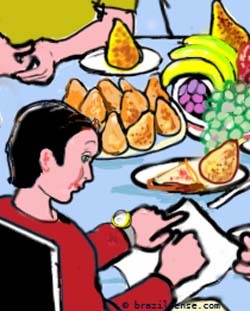 Brazilians are asked for their month and day of birth in mundane situations like entering a health club or special ordering a book at bookstore. Giving your name is understandable but what's with the birth date? Sao Paulo and Rio de Janeiro are either 1, 2, or 3 hours ahead of Eastern Time depending on the time of year. How can it be three different values? Most of Brazil observes daylight-savings time but being in the Southern Hemisphere, the seasons are reversed. When the US and Canada enter summer time, Brazil leaves it, and likewise for winter, so the time difference expands or contracts by 2 hours leading to a 1 or 3 hour difference. Complicating it, the US, Canada, and Brazil don't switch on precisely the same day, so there is a couple weeks in the spring and fall when one side has switched but the other hasn't, giving a 2 hour difference for those couple weeks. The number 13 is not bad luck in Brazil, and nor is it common knowledge among Brazilians that it is considered unlucky in the US and Canada. Friday the 13th is unlucky in Brazil, but jokingly; nobody takes it seriously. Buildings in Brazil have 13th floors. 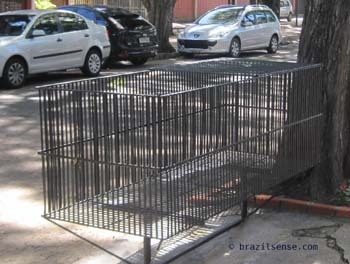 Some residential streets in Brazil have what look like giant animal cages or birdcages. Often they are locked with a padlock. What do you think is the use?. Prior to experiencing Brazil, one might imagine that the people of a tropical country eat mostly fruits, vegetables, nuts, and fish. But your intuition would be wrong. Brazilians eat a lot of meat, rice, and beans. Lettuce and nuts for example are actually more expensive than in the US and Canada. Pizza is unexpectedly popular. Whereas Canadians and Americans think of pizza as fast food, Sao Paulo has some luxury pizza restaurants. 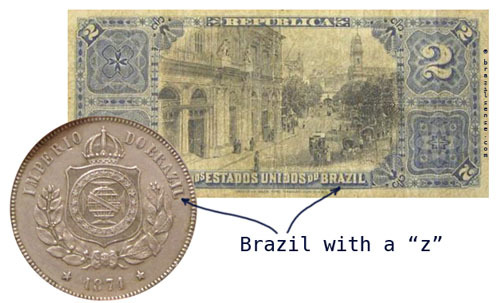 Old Brazilian currency that spelt Brazil with a "z". Brazilians spell their country name as Brasil with an "s", not a "z". The country used both spellings a hundred years ago as you can find in old official documents. There are government issued coins and notes with the "z" spelling. Brazil later standardized on the current spelling, Brasil, with an "s". This site uses "z" since that's the usual English spelling. This page was last modified on 3 May 2014, at 09:37.